Weight:2-11 pounds and 12-24 pounds. Rabbits are small mammals with fluffy, short tails, whiskers and distinctive long ears. There are more than 30 species around the world, and while they live in many different environments, they have many things in common. They are very social creatures and live in large colonies. The busiest time of day for rabbits is at dusk and dawn when they venture out to find food. The low light helps hide them from potential predators. A rabbit’s life span is about 8 years. Sterilized rabbits (sprayed or neutered) can live as long as 10-12 years. Rabbits have a high rate of reproduction because roughly 15% of new born rabbits survive their first year. Therefore more babies increases the survival rate. Diet: Wild rabbits are herbivores and have a plant based diet and are not eat meat eaters. Their food includes grasses, clover and some cruciferous plants, such as broccoli and Brussels sprouts. They are opportunistic feeders and also eat fruits, seeds, roots, buds, and tree bark. 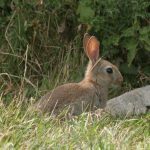 Habitat: Wild rabbits make their homes, known as warrens, by tunneling below the ground and in variety of places with different temperatures. Tunnels have multiple entrances for quick escape and a tell tale sign of their presence. Wild rabbits can be found in woods, forests, meadows and grass lands. They can also be found under sheds, in rubble and in piles of dead tree roots and branches. Impact: As herbivores agricultural land and their nutritious and plentiful crops will attract them. Therefore they can affect farms and agricultural fields, forests, orchards, sports fields in a big way with their burrows and holes. Watch for holes or gaps that are larger 25mm. Any such hole will b an exit/entry point. 48 inch tall Wire Mesh Fencing with 6 inches or more below ground.